Itâ€™s safe to say we have all been left dumbfounded as we follow up a glorious fairway splitting drive with a miserable topped golf shot. Left perplexed we ponder how on earth we have only managed to hit the very top of the golf ball and as a consequence see it literally bounce a few yards down the fairway. A thinned shot may have at least maneuvered us a decent distance towards the green, but a topped leaves us fuming at the sheer waste of a shot we can ill afford to squander in this way. Iâ€™m probably not the first to think at least a good whack with the putter would have resulted in an altogether more fruitful shot! The reality is that in a fraction of a second our confidence is knocked and we immediately start to analyse why we made this school boy error. We quickly hunt for a cure as quickly as possible, knowing full well the topped shot is just lurking around the corner ready to pounce again when we are least expecting it. Picture the scene, you have 175 yards left to reach the green, thereâ€™s hardly a breath of wind and the sun is beating down on the back of your neck. Everything is right with the world and one solid swing and you will be safely clear all of the danger including a stream running immediately in front of you. Then all of a sudden the expectant sound of a crisp iron shot is replaced with a thud as your ball bounces immediately in front of you before disappearing into the water hazard. Thereâ€™s no doubt the topped shot in golf can sometimes be a card wrecker, and on other occasions you can take it in your stride if you have had the fortune to have avoided trouble. Whatâ€™s guaranteed is that this all too common swing fault for beginners can rear its ugly head for even the most experience player and the result is never predictable. Bunkers either side of you, that you never imagined were in play, have a habit of wonderfully catching the most horrible topped shots that shoot off at an angle! History shows that a player will immediately assess all parts of their swing following a topped shot, wanting to know exactly what caused them to top the ball and how to prevent it in the future. Many will default to the fact that they looked up at the moment of impact without truly looking into why they only managed to hit the very top of the ball. Others will ask themselves are they standing too close or too far away, is their swing too flat or steep, are they shifting their weight properly, are they dipping, are they swaying and the list goes on. It can be a real struggle to pinpoint the answer and fix it. Fortunately the instruction below will show you how to stop hitting topped shots on the golf course, itâ€™s definitely time to end the frustration caused by topping the ball. Reading this article will enable you to understand what causes a top, the various cures to eliminate it and finally the drills to make sure you never top the ball again. No longer will you see your ball woefully bobble along the fairway, instead of successfully being airbourne ! Without a shadow of a doubt this swing fault can easily be fixed and see you once again consistently hitting out of the middle of the club again. So letâ€™s take a closer look at defining the topped shot and what specifically causes it. What Is A Topped Golf Shot? A topped golf shot is caused by a player hitting the ball above its equator. Compare this to a thinned shot where the leading edge of the club face catches the ball below the equator but not low enough to make full contact. If you hit the very top of the ball it will literally go only a few yards, a thinned shot will fly with a low trajectory and sometimes fly further than planned due to the large amount of top spin. A professional may indeed try to play a shot slightly thin when the shot in front of them calls for it, but they will never deliberately try to top the ball. There may only be fractions between how thinned and topped shots are struck, but they are poles apart when it comes to what the average golfer deems acceptable as part of their own game. Now letâ€™s look at 8 different causes for topping a golf ball. What Causes A Topped Golf Shot? The first step to prevent you from topping again is to understand exactly what is causing this occur in the first place. There are several reasons as to why you are hitting the top half of the ball and all of these are explored in detail below. Each explanation will help clarify different reasons as to why you are striking the ball in a manner that causes you to top the ball. Here are 8 reasons why golfers hit topped golf shots. This is the most common reason why beginners top the ball. Far too frequently they look up too early to see where their ball has gone. As they look up, their head moves up and in doing so they raise their body at the same time. This consequently leads to the club head being pulled away from the intended swing plane, thus leading to only the top of the ball being struck. They are effectively coming out of their swing too early. The topped golf shot is often the result of hitting the ball on the upswing rather than on the downswing. By hitting above the equator you force the ball into the ground and from there it bounces along without ever properly getting in the air. It is critical to understand that the golf club should hit the ball on the descent, and in doing so you should be hitting a divot. Remember you should be hitting the ground under and in front of the ball. Often a beginner will falsely believe that they should be trying to hit the ball as they swing up. In fact they demonstrate this by moving their ball too far forward in their stance, thus increasing the chances of striking the ball incorrectly on their upswing. All too often a topped shot happens when you are trying to hit the ball too hard. Typically you have played a poor tee shot on a par four and you have still left yourself with a fairway wood or hybrid to the green. As a result you get tense, feel the need to swing harder, and bend your arms as you come through impact. By contracting you arms in this manner you inadvertently swing with your grip behind the ball resulting in the leading edge of the club striking the ball above the equator. At impact the left arm should be straight and the right arm slightly bent, avoiding at all costs the â€œchicken wingâ€ position at impact where the elbow points out toward the target. Bending your left arm will prevent you from swinging with the widest arc possible. The beginner will often feel the need to lift the ball into the air, when in fact they must appreciate that this will happen automatically due to the loft on their golf clubs. Thus if you are new to the game try to resist an action during impact where you try to get the ball in the air by pulling your arms up. You can unconsciously find yourself doing exactly this with your fairways woods and long irons because you believe the low loft found on these clubs isnâ€™t enough to get the ball sufficiently into the air. By pulling your arms up you inescapably bend your arms and in doing so you narrow your swing arc. The reduction in the width of your swing moves the club head closer to the body and leads to the bottom of the club face hitting just the top of the golf ball. The lesson is to stretch your arms out and trust the loft on your clubs. You will top the ball if you raise your body up during either your backswing or downswing. All too often a player will straighten their hips slightly and in doing so this motion will lead to the sole of the driver hitting the top of the ball. It is important to maintain the same height throughout the swing. Swaying can cause topping simply because you are in effect moving the arc of your swing. This action moves the lowest point of the arc to a position an inch or so before the ball. As a result you are more than likely to hit the ball on your upswing and above its centre, thus producing a topped shot. A golfer hitting from the top with their arms and hands rather than letting the natural tension built up by the body initiate the downswing is prone to an array of miss hits including a topped shot. You may top the ball if you have swung with a reverse pivot. This means you have incorrectly transferred your weight to the left side at the top of your backswing and as you swing down you move it over to your right side away from the target. Typically the downswing will be steep and can be the catalyst for a number of faults included topped shots. Now that you understand what may be happening within your golf swing to cause you to top, you will be in a better position to use the following 6 ways to cure this problem. The following section gives you 6 cures to hitting topped golf shots. You will learn how to hit down and through the ball without topping it. By staying down on the shot the ball will be struck correctly and go up in the air as intended. Raising your body during your downswing or upswing will increase the chances of topping the ball. To prevent the possibility of this happening I recommend you learn to rotate around your spine, keeping your weight on the right side during the backswing. Additionally keep your knees flexed through the swing, donâ€™t them straighten up. Set a wide arc from the beginning by taking the club back low to the ground for the first foot or so. Simultaneously ensure your left arm is as straight as possible so as you avoid it collapsing along with your wrist through impact. Furthermore increase your chances of performing a wide arc in your golf swing by maintaining a good posture. Working on taking a divot after the ball can be a difficult concept for the newbie golfer to grasp. Instead they try to hit the golf ball flush and not surprisingly often mishit with the result being a thinned to topped shot. You will cure your topped shots once you can consistently strike the ball on the descent, creating a divot after the ball. This also applies to hitting your fairway woods and hybrids as they also need to be hit with a small downward strike. To avoid hitting the ball on the upswing and consequently topping it I recommend a cure whereby the ball is positioned no further forward than the left heel. Look at this article titled Proper Golf Stance Setup Tips for further advice. By keeping your eye on the ball you will be forced to keep your head down during your downswing. Your head should only come up with the momentum of the follow through. This simple cure will help prevent you from coming out of the swing too early. Check you don’t have too much weight on your left leg during your backswing. It is important to have the majority of your weight on the right side at the top of your backswing. You will feel you have swung incorrectly if your left knee and shoulder dip during your backswing. If you have most of your weight on your left side at the top of your swing the inevitable will happen as you start your downswing, namely all of your weight will move to the right side. Next your left side will raise up along with the arc of the swing, consequently leading to the club face hitting the ball above its centre. Now that you have read what a topped shot is, what causes it and 6 proven cures, itâ€™s time to study 5 drills and fixes for you to incorporate into your next practice session on the range. All of the following drills can be used to help prevent you from topping any further shots. Apply these corrections on the range so as in time they naturally become part of your swing. As mentioned previously it is important to restrict the amount you dip and raise your body during your golf swing. A good drill here is to have a friend place his out stretched hand on your head whilst you make a swing, making sure the friend’s stance is such that you won’t hit his feet on your downswing. If you start to move your head up, your friend and you will definitely feel it and you will know you havenâ€™t maintained a fixed head position. When your head comes up, you will also pull your upper body up and hence your arms and club. It only takes for you to rise up half an inch to catch the top of the ball with the bottom edge of the club face. If you have a tendency to bend your knees you will also need to maintain that position all the way through impact as well. Your friend will also be able to tell whether you are swaying your body even if you canâ€™t feel the movement yourself. If you are alone and itâ€™s sunny, you can also check how much your body sways by studying the shadows. As a final word on this drill it is worth reading the free chapter on The Backswing from The New Magic Moves To Winning Golf if you havenâ€™t done so already, so as you can benefit from knowing how to reach the top of your swing without swaying to the right. Hold a club horizontally across your chest, held with your hands folded flat against chest. The handle should point to the target and when you swing correctly with a good shoulder rotation the grip should point to the ball. Use this drill to practice the correct backswing body rotation. Next continue the drill with a downswing through impact. A clear signal that you have swung through correctly is when you face the target with your right shoulder lower than your left. If you find you are swinging through with your right shoulder level or above the left shoulder it is likely you have raised your body on the downswing. This often occurs due to an incorrect set up and poor posture and the need to compensate during the golf swing. Itâ€™s recommended you spend time on the range working on delaying the action of looking up. This way you can counter any instinct to go looking for your ball. By keeping your eye on the ball you maintain the angle of your swing and donâ€™t run the risk of topping because of any angle changes. It is important though to not restrict yourself too much and the exact amount can only be accurately determined by working on the range. Here are some pointers and checkpoints to stop you from raising the arc of the swing. Ideally you should set up with your knees only slightly bent. Bending too much only means you will straighten up too much as you begin your backswing and as a consequence raise your swing arc. To determine further whether you are moving your head, set up with your head up against a wall and swing maintain your swing angle and preventing yourself from lifting your body as you make a golf swing. Another checkpoint is to pay attention to your right knee. Make sure you aren’t straightening the right knee into a locked position at the top of your swing and thus raising the arc of your golf swing. The right knee should be slightly bent throughout the swing. I recommend keeping your right heel on the ground a fraction longer in order to prevent topping the ball by raising the swing arc. As pointed out earlier it is critical to hit the ground under and in front of the ball. If you are currently having problems doing this I recommend you mentally pick out an piece of grass in front of your ball in order to create a divot. This should make it easier to hit the ball on the descent and thus make a divot after ball. Thanks for the tips they have helped so much. Can you also explain why do I seem to hit the ground about 3 inches before the ball. Thanks again Andy. Like the tips how to avoid thin shots, this article is equally helpful to people like me who experience this problem from time to time. Thanks for that tip. I think you were able to pinpoint my avalanche. Will try to correct at the range next visit. just tried to implement them today during a round and made a real improvement in my short to middle irons. I have a question that may relate to your treatise on how to take a proper divot with irons. In the process of playing two 18 hole rounds of golf per week with various individuals, I watched whenever I can, where they position the ball in their stance, particularly with the driver, and noted that some guys hit the ball a long way with the ball positioned more to the center of their stance; a position I had long since departed from. With the irons, I take your advice not to play the ball any further back than the middle of the stance, and move the ball forward according to the club I will use. My ball flight pattern in generally a fade, sometimes virtually straight, and occasionally, I have a slight pull to the left that will track back towards center. I have attempted to incorporate all of your recommendations over time, but still for the most part, take a divot just “at” the ball, or an inch or less behind. One practice session a while back, I concentrated on driving my hinged hands at the top, down towards the ball and got excellent ball flight, however, lately I generally do not get good elevation with irons below the 7 iron. Finally, as a 76 y.o. golfer, I no longer have the flexibility I once had and my game is a struggle to maintain a “bogey” round or slightly less, hence I have gone from a bogey player (mid 80’s) to something closer to the mid or upper 90’s and having a devil of a time to cut strokes. (Inconsistency). As we go into Winter, I can only hope to fine tune my ball striking then hopefully resume next spring with added vigor. I believe it will happen with your superb instructional entries. 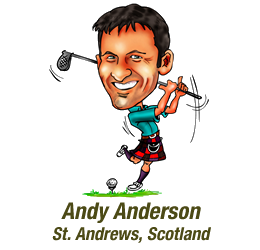 Hi Andy, much thanks for tips on eliminating thinned shots. I never take a divot,so am off asap to practice ur tips. Hi Andy. I have just come home after one of the worst games of golf I have played for ages. I opened my emails, and read yours about the thined shots. It made so much sense and I knew that some of the faults you mentioned was what I was doing. Can’t wait to get out and try the cures. Great email, many thanks. Roy R.
I`m playing in the morning and I`ll put them into practice. Many thanks for your article on “topping”. Was quite a feature of my game, but you have made me think about it much more with your simple and obvious tips. My game has definitely improved. Thanks again ! Thank you very much for this good revision . I already bought your CD and your book. Thanks Andy, you couldn’t make it any clearer. I’ll try this and hopefully it will help me cure my problem, which surprisingly I experience more with my utility clubs and 3-wood. I take the opportunity to say that all your tips are good. Andy = you’re a star = I’m nearly ready to give up the game after 55 years of playing = top it = it’s every shot and yes the ball only moves a couple of feet in any direction and now it’s spread to my driver/2wood. Hi Andy, as a “left handed player” i sometimes find the instructions a bit confusing, but i found “topping” the ball instructions very easy and helpful.and will practise next time at the range. It would be helpful if you could advise me were i can get a video for left handed players. I am still playing but unfortunately I have misplaced the CD /literature I purchased from u afew years ago. In a round I have moments of excellence and moments of total frustration. Invariably I score mid nineties with 3 x 8,s on the card. Recently I went to bali and played twice at nirwana -Scoring below 100 twice but I know I am capable of better than this any tips to elminate the 8s? An absolutely excellent article on golf’s most annoying mishit. Excellent reading article and brought back a few forgotten basics. Andy: my Scotish friend, thanks to send me golf tips, appreciate. I’m on the 70’s, but i played good golf, here in Monterrey, Mexico. bless u.
I’ll work on your tips as I do top shots sometimes just after a good drive which is very frustrating. Your instructions on topping couldn’t have come at a more appropriate time. With slushy mud and long grass off the fairways (NZ winter) it has become regular to lose 2 shots per 9 hole round in this way! Excellent reminder how to avoid topping the ball. I recall a comment by Jack Niclaus “If you look up too soon it’s odds on you wont like what you see”. The best of your articles. Well done. Understandable and in everyday language.